The brachial artery is palpated on the anterior aspect of the elbow by gently pressing the artery against the underlying bone with the middle and index fingers. The brachial artery pulse will be used to measure blood pressure with a stethoscope and sphygmomanometer in the next demonstration. 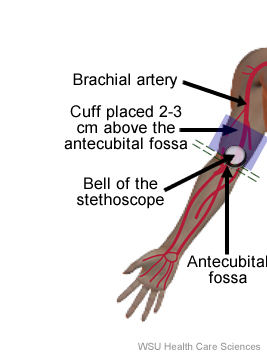 The lower end of the blood pressure cuff is placed 2-3 cm above the antecubital fossa, which should be at approximately the same vertical height as the heart while allowing room for the stethoscope. The cuff should be placed snugly around the upper arm, and the bladder of the cuff should cover at least 80% of the arm's circumference. The bell of the stethoscope is placed over the brachial artery with a good seal using light pressure. Applying too much pressure with the bell of the stethoscope will cause it to act like the diaphragm, and high-pitched sounds will be heard better than low-pitched sounds. Blood pressure cuff and stethoscope bell placement are pictured to the right.